Utah has always been heralded for having some great outdoor activities that take place within its varied landscapes and climates. However, whether visitors flock to Utah for its hiking, biking, climbing, white water rafting or any other outdoor recreation, they will undoubtedly need a place to stay. Instead of travelling to hotels miles away from all the fun, there are plenty of top quality campsites in the state near some of its best in outdoor recreation. There are many campground in Utah that are consistently ranked on top 100 lists for scenery, quality, and nearby activities, so here are a few that visitors can really get into. 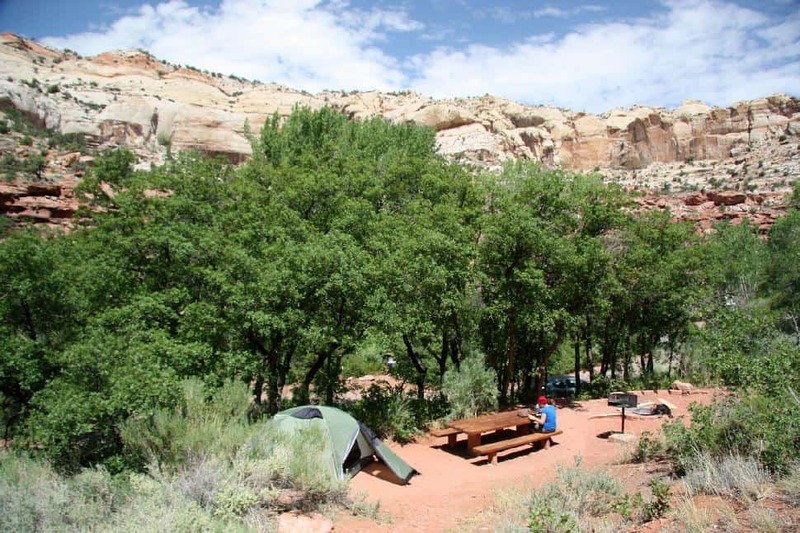 Calf Creek Campground is located in southern Utah near the Calf Creek Falls. This is a great campground for the hikers. Trails surrounding the campground lead through mineral-streaked cliffs of Navajo sandstone, past beaver ponds and prehistoric art sites to landmarks like the massive 126-foot Calf Creek Falls and the breath-taking plateaus of the Grand Staircase in Escalante State Park. This small campground fits in perfectly with the surrounding area; it is rugged, high in elevation and extremely remote. As the campground is located on a bit of a plateau there is not much in the way of vegetation to provide privacy or shade to the campsites, but the view of the surrounding area and the quality of the hiking is some of the best in the state. There have been a few developments to the campground including volleyball courts and a playground to provide for a little extra recreation to the area, but hiking the surrounding area is likely to keep campers busy enough. Campgrounds in Moab have become some of the most sought after camping spots in Utah due to its unique combination of red rock cliffs and the presence of the cool waters of the Colorado River. Big Bend Campground is a favorite base camp for mountain bikers, hikers and river expeditions. The campground itself sits right along the waters of the Colorado River, high enough to avoid flooding, but close enough for campers to enjoy its white sand beaches. The campsites near the beach are group sites, which makes Big Bend popular among river expedition parties. Across from the campground is Arches National Park and the town of Moab is just ten miles away for those that need to make a supply run. The area surrounding the campground is sheltered by beautiful red rock cliffs and there is some light brush to help separate the sites. Reservations are available and it is recommended to take advantage of it due to the popularity of the campground. Reservations are especially recommended during peak river rafting season as many kayakers lover to pull up on the beach and book sites. Zion National Park is the most popular national park in Utah with tons of unique hiking and climbing opportunities throughout. Naturally, the state's best national park needs to also host some of the state's best campgrounds. 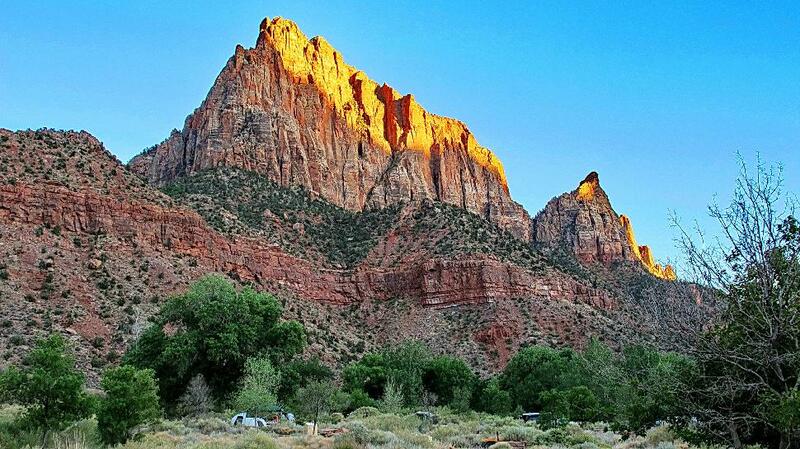 There are three campgrounds in Zion but Watchmen Campground is the ideal place to stay. It is located nearby to the South Entrance of the park, just a few miles from the town of Springdale and is a short walk from the visitor's center. The campground is located next to a number of interesting trails that run throughout the park, but visitors should take advantage of the trail leading to the campground's namesake--Watchmen Peak. Watchmen Campground is surrounded by tall sandstone cliffs that glow red and orange in the sunset and Watchmen Peak rises above them all. Visitors can also stroll along the nearby Virgin River and marvel at its handy work, a canyon that was carved out by this small but powerful river. The campground itself is moderately forested so campers will be privileged to some privacy. With the beautiful Cottonwood trees on the campground, camping in Watchmen is a must in the fall when the tree leaves turn gold in color. It is a stunning sight against the red rock backdrop. The Red Cliffs Campground is located just off the freeway in a shaded nook of riparian vegetation. This particular campground can be tricky for RV campers as the only way to access it is through a rock tunnel that is 12 feet high and wide. Visitors will have to make sure that their RV or trailer can fit the gap before hand or be prepared for a bad time. However, this difficult access makes for a perfect tent camping playground. The campground is located next to a series of trails that lead to a number of archeological and paleontological sites. These sites include dinosaur foot prints and an ancestral puebloan site that detail the rich and long history of the area. The campground is also part of the conservation area for the endangered desert tortoise, so campers may be privileged to see one, but they should not disturb them. Aside from enjoying the wildlife and archeological sites, there are a number of trails that lead up into the red rock cliffs, but as the campground is surrounded by the cliffs in a shaded canyon there will be no shortage of stunning views from the campground itself. Sick of the red rock cliffs that are the usual backdrop of Utah campgrounds? Mahogany Cove Campground is a wonderful example of the diversity of setting that is possible with Utah. The campground is nestled in a grassy meadow surrounded by tall forests of mahogany, pinion, juniper and ponderosa pine trees that provide partial shade and privacy to the sites. Visitors can enjoy hiking or mountain biking through the trails that lead through the Tushar Mountains. However, this campground is more popular with the fishermen who come to cast their line in Beaver River that is chocked full of rainbow and brook trout. Mahogany Cove provides access to all of these activities and it is also located along the Beaver Canyon Scenic Byway which makes it a popular stop for those traveling through the area as well.